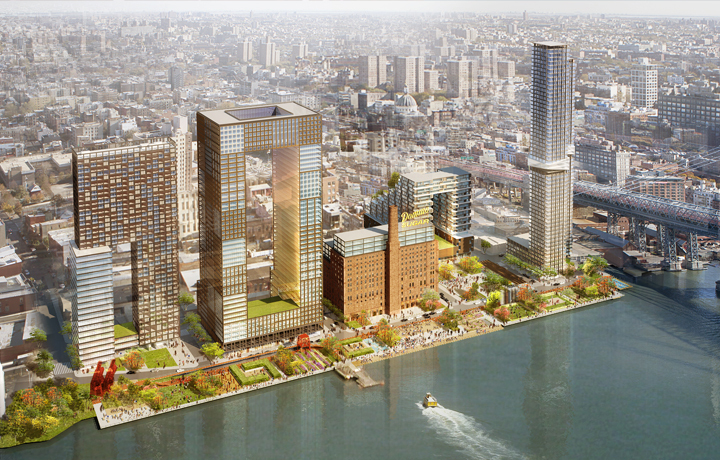 Council Members criticize Domino Sugar project despite “deeper affordability.” On April 24, 2014, the City Council Land Use Committee voted 19-0 to approve an application by Two Trees Management to redevelop the Domino Sugar Refinery into a 2.2 million sq. ft. residential, retail, and commercial office spaces with several acres of public esplanade and parkland along the East River waterfront. (See more CityLand coverage here.) The Land Use Subcommittee for Zoning and Franchises voted 9-0 to approve the project. The committee votes followed lengthy negotiations between Two Trees and the Council. Council Member and Zoning and Franchises Chair Mark Weprin announced modifications to the original proposal concerning the development’s structure authority powers and review board. Local officials and community stakeholders will have the ability to directly appoint members of the review board, which is tasked with making determinations and approving proposed public programming for the site’s public access and waterfront public access areas. Under the modifications, Two Trees will be required to submit to the review board annual reports with information relevant to the maintenance and operation of the public access and waterfront public access areas, including operation costs. During the Subcommittee vote, Local Council Member Stephen Levin commented that “North Brooklyn is ground zero of gentrification,” which has had “destabilizing effects on the community.” Council Member Levin stated that the modifications would ensure that housing is available to people making 40-60% AMI, which he states is “a deal that will meet the community’s needs in terms of … deeper affordability.” Following negotiations, Two Trees has agreed to set the affordability of lower-income housing at 70 percent of AMI or less, which equals $61,130 for a family of four according to the 2013 AMI threshold. Two Trees will also make available “a handful of moderately affordable units,” set at 125% of AMI. Noting the “extreme need” in the North Brooklyn community for family-sized affordable units, Council Member Levin stated that Two Trees agreed to incorporate as many affordable two and three bedrooms as possible. The Domino Sugar application modifications will go back to City Planning before the full City Council can vote. The vote will represent the end to a six-year long history of the Domino Sugar Refinery project. City Council: Domino Sugar Refinery (C 140131 ZRK–Zoning Text Amendment); (C 140132 ZSK–Special Permit); (C 140133 ZSK– Special Permit); (C 140134 ZSK–Special Permit); (C 140135 ZSK– Special Permit); (C 140133 ZSK– Special Permit)(April 24, 2014).